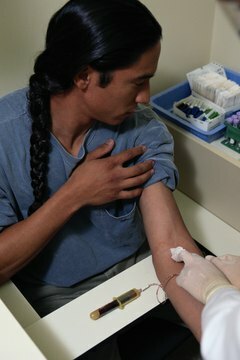 Doctors test potassium levels by doing a simple blood test. Potassium, a mineral found in many foods, plays a vital role in heart function, controls muscle contractions, transmits nerve impulses, balances fluid in the blood and maintains blood pH. To support these functions and remain healthy, it is important to maintain the normal value of potassium in your body, listed by MedlinePlus as 3.2 to 5.7 millimoles per liter, which converts to 125 to 223 milligrams per liter. Doctors can perform a blood test using a small sample of blood to determine your potassium level. 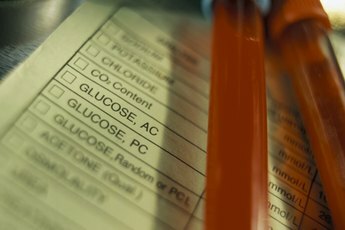 This test may be done as part of a routine metabolic panel performed at a regularly scheduled physical examination. The test may also be ordered to monitor specific health conditions, like kidney disease. Because potassium levels can affect the activity of nerves and muscles, doctors may also perform a potassium test on patients with diabetes, heart problems and high blood pressure. A high potassium level -- defined as 7.0 millimoles or 274 milligrams per liter or higher -- causes a condition known as hyperkalemia. Hyperkalemia causes symptoms including nausea, muscle fatigue and weakness that can lead to paralysis and abnormal heart rhythms. If left untreated, hyperkalemia can become life-threatening. Because your kidneys remove excess potassium from the blood, kidney disease and kidney failure are the most common causes of hyperkalemia. Other causes include alcoholism, diabetes, Addison’s disease and the use of medications like non-steroidal anti-inflammatory drugs, beta-blockers and ACE inhibitors prescribed to treat high blood pressure. Doctors diagnose a potassium level that drops below normal to 2.5 millimoles per liter, or 98 milligrams per liter, as hypokalemia. Hypokalemia causes weakness, lack of energy, muscle cramps, stomach problems and abnormal heartbeat. Hypokalemia must be treated by a doctor, or it can become life-threatening. Low potassium levels rarely occur due to a lack of potassium in your diet but can occur due to excessive vomiting or diarrhea, medications like diuretics, corticosteroids or insulin or diseases like aldosteronism or chronic kidney failure. To maintain normal potassium levels in your body, eat a healthy diet full of fruits and vegetables. Good sources of potassium include bananas, potatoes, avocados, cantaloupes, tomatoes and lima beans. Fish like salmon and cod and chicken also contribute potassium to your diet. The Institute of Medicine recommends that adults consume 4,700 milligrams of potassium per day to support normal functions in a healthy person. 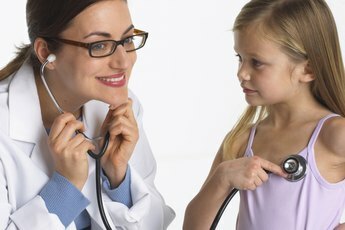 If you suffer from medical conditions that can affect your potassium level or take medications that increase or decrease your potassium levels, visit your doctor so he can monitor your levels and prescribe supplements, if necessary, to maintain normal potassium levels. Do Avocados Cause High Cholesterol?